Digital marketing is a sink-or-swim environment for marketers. There is always something new happening, from evolving search algorithms to ever-changing social media strategies. It cannot be denied that online advertising channels have become oversaturated with businesses that are trying to stand out. If you don’t stay on top of what’s happening in the industry, you will struggle to keep your brand afloat. As a digital marketing company, you need to figure out the best strategies and tools to offer your clients. We’ve compiled a list of the top advertising stats of 2019 so you can spend money where it matters. These trends will help agencies make the line between ad and direct revenue even clearer. 96% of B2C marketers choose Facebook as their marketing platform. According to a survey sponsored by Clutch and Smart Insights, Facebook is the top choice among B2C marketers when it comes to social media marketing. This is followed by YouTube at 82% and Twitter at 77%. As of 2018, over 70 million businesses have existing Facebook Pages. The survey suggests that it has a lot to do with the platform appealing to a wide range of people, allowing brands to create communities of users. Social media has become more than just a platform for keeping in touch with friends. Digital consumers of today use their social feeds to follow the news and their favorite brands. A study by Global Web Index reveals that 4 in 10 internet users follow business pages on social media. What’s more, 1 in 4 follow brands which they are considering making a purchase from. This is why you shouldn’t underestimate your social media content. Whatever you share with your followers could make or break a conversion. Are you familiar with Maya Angelou’s popular quote that goes “People will forget what you said, people will forget what you did, but people will never forget how you made them feel?” This applies to social media too. It has been found that 48% of social users will most likely purchase from responsive brands. Social media users love it when a brand responds to them directly. You see, everytime we post, comment, or share online, we are creating an expectation. When that expectation is validated, it triggers a dopamine response. It feels good. Thus, when a brand responds to engagements in a positive and timely manner, it creates a strong sense of loyalty. Brand value will significantly increase. Snapchat and Instagram are popular among ages 18 to 24. The young-adult population stands out when it comes to social media consumption. While Facebook remains the most popular platform in the US, Snapchat and Instagram dominate the usage of Americans ages 18 to 24. A Pew Research Center survey shows that 78% of 18- to 24-year-olds are Snapchat users and 71% are Instagram users. Instagram stories are said to be stealing the show, with up to 400 million daily active users. Both brands and consumers are loving the ‘freshness’ of the said feature. It is a creative vehicle in promoting products and services, allowing users to collate photos and videos and overlay them with text, graphics and emojis. Social networks are the most influential media used by online shoppers regularly to “find inspiration” for a purchase. This is according to a Global Consumer Insights Survey for 2018. The numbers are higher compared to those turning to retailer websites and price comparison websites. Smartphones and other devices beat desktop and accounted for over two-thirds of the total digital media time of internet users. Study shows that 69% of digital media time is spent on mobile while only 31% is spent on desktop. This is one of the reasons why mobile advertising has become increasingly important over the past decade. Google conducted a study about how smartphones are changing the retail landscape. They found that 82% of smartphone shoppers consult their devices on purchases they are about to make. Common activities include making price comparisons, looking up promotions, reviews, and alternative store locations, and sending photos to friends. If you are looking to improve your mobile search traffic, Google is where you want to be. The platform continues to dominate mobile search in the U.S. It’s not enough that you are visible in the first page, make sure you offer a great mobile experience to users. It matters to show up in mobile search ad results. It not only increases brand awareness by up to 46% but also exposes the brand to a new group of smartphone shoppers. Study shows that 51% of mobile users have purchased from a company other than the one they are searching for online because the information provided was useful. Online retailers are changing the way we shop and mobile shopping is the consumer trend to watch. A study commissioned by Salsify revealed that 84% of online shoppers between the ages 18 and 29 are most likely to do it through their mobile devices. They also found that people above 60 years old are the least likely to shop via smartphones. While B2Cs enjoy the ease of social media, enticing customers with promo offers, B2Bs have more success with email marketing. Around 86% of professionals prefer email as their communication channel when it comes to business purposes. That said, it has been found that CTRs for B2B email campaigns are actually 47% higher compared to B2C email campaigns. While considered to be one of the oldest forms of digital marketing, it cannot be denied that email campaigns still work. 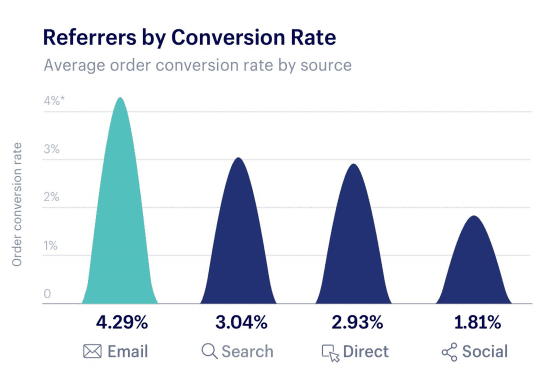 According to data analyzed from over $1 billion Shopify sales (from Black Friday/Cyber Monday), email marketing has the highest conversion rate. You can see that email surpassed the conversion rates of other channels with search having only 3.04% and social at 1.81%. Bear in mind that results may change during normal trading. Nevertheless, this data proves that email marketing has the potential to give impressive results. If CTRs and increased traffic won’t convince you to improve on your email marketing campaigns, a consistent flow of cash might change your mind. Email is a proven revenue-booster for B2Bs. Around 59% of B2B marketers choose email as the most effective channel for generating revenue. There has never been a more exciting time to be an email marketer. If done right, email marketing campaigns can contribute up to 21% of a company’s overall revenue. Effective use of data can deliver relevant, personalized experiences for target audiences which are highly effective in obtaining higher order values, conversion rates, and CTRs. The best way to get your target audience to share content is through email. Getting a user to share on Facebook, Twitter or Instagram can gain you thousands of new potential followers and tons of referral traffic. It’s also an effective method to earn permanent links that will boost your domain authority. You see, if users share, the people they connect with on social media and those that trust their opinion will likely trust the brand they are recommending too. Stats prove that email is the best way to do it. Segmentationa is a personalization tactic wherein email subscribers are divided into smaller segments, based on set criteria. This is a popular strategy among email marketers, and for good reason. MailChimp conducted a study on the “Effects of List Segmentation on Email Marketing Stats”. They found that segmented campaigns achieve higher open rates, more clicks, lower unsubscription rates, and fewer bounces. Even email marketers recognize that we now live in a mobile-first society. Thus, they are seeing the importance of catering to mobile users. 73% of email marketers admit that they are prioritizing optimizing email for mobile devices. This is a 95% increase from 2017 and is expected to increase as the year progresses. Who doesn’t want more qualified leads? A report by Aberdeen Group says that video marketers get 66% more qualified leads each year. Video ads can be so effective in lead nurture campaigns. They convey more information but can still be entertaining. Videos also have a higher recall and convert at higher rates. 64% of consumers say that watching a video on Facebook influenced them to make a purchase. Video ads on social media are not only driving engagement but influencing purchase decisions in a big way. 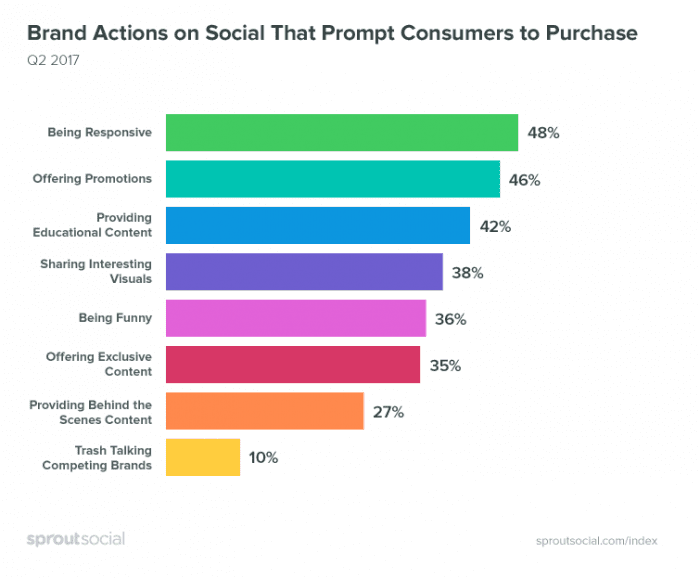 Hubspot published a report on social video trends and found that 64% of consumers consider watching videos on Facebook as a big influence on their purchase decisions. Meanwhile, 52% of consumers are influenced by the video ads they have watched on YouTube. Customers usually try to solve product problems on their own before reaching out to a support team. Videos can facilitate their need to DIY. According to Wyzowl, 68% of users would prefer to watch an explainer video to solve any product or related problems, as opposed to speaking to a brand representative. It can save you valuable time and resource! Nearly 50% of internet users look for videos related to a product or service before visiting a store. In an infographic published by Google, almost 50% of internet users turn to their mobile devices to look for videos related to a product or service before visiting a store to make a purchase. will To entice your audience to pay attention to your ad, incorporate clear typography, large fonts, eye-pleasing colors and good music in your video. Average video CTR increased to 0.45% in 2017. Before spending big bucks on video campaigns, it’s important to understand its performance. Based on the 2017 benchmarks by ExtremeReach, the overall average video CTR increased slightly to 0.45% as opposed to 0.35% in 2016. The biggest increase was among desktop users – from 0.36% to 0.71%. With the right strategies, businesses can double their investment on Google ads. Google’s chief economist Hal Varian estimated that for every $1 you spend on the platform, you make $2 in revenue.This was based on observed cost-per-click activity across a large sample of Google ads advertisers. For a majority of PPC managers, text ads are a profitable investment. 87% voted for text ads as the most effective PPC channel. Potential customers actually encounter text ads first when they search for something related to your business. Because text ads are the ‘first contact’ it’s crucial for PPC teams to get it right. A well-written or optimized text ad could improve CTR and lower CPA (cost per action). Google ads CPC is $2.69 on the search network and $0.63 on the display network. CPC (cost per click) can sometimes be the determining factor whether you’re PPC campaign would be successful or not. If you want to make a profit, get the price of your CPC right. Based on Wordstream’s Google ads benchmarks, the average CPC within the platform is over $2 higher for ads in the search results. Paid ads are more prominent. They take advantage of a visitor’s willingness to buy and direct them to a landing page for instant conversion. When a user is on ‘buying mode’ they don’t really care whether it’s an organic or paid ad. According to statistics, 50% of the people arriving on a retailer’s site after clicking on a PPC are more likely to buy than those who came from organic links. According to eMarketer’s data on the total US digital ad spending, Google still reigns as the top competitor and may continue to do so until 2020. In 2017, Google controlled 38.6% of the total US digital ad spend. Facebook followed with a 19.9% share. In 2018, it is estimated that the two giants have a combined 56.8% share. On a side note, the shares from two companies are expected to decrease slightly over the next few years because of popular advertising platforms like Amazon and Snapchat. Consumers don’t hate ALL ads, they hate bad, obnoxious ads. Of the 13 ad types internet users were asked about, pop up ads have the worst reputation. It interrupts a user’s browsing experience to the point that it comes off as annoying. In fact, 73% of consumers say so, especially ads that pop over the entire screen. This doesn’t mean that pop up ads are not to be used though. It’s just giving marketers a precaution that in using pop-up ads as part of an advertising strategy, they should do it in a way that doesn’t damage the browsing experience. With 4 in 10 internet users following their favorite brands on social media, it’s not surprising that they want to see discounts, sales and promotions. In fact, 72% of consumers agree. Unfortunately, only 18% of marketers post deals on a regular basis. There is an obvious disconnect between what consumers want and what marketers are delivering. Most brands focus on posting content that teach something and those that tell a story. The digital marketing industry has seen a great revolution over the past few years. The internet became this ocean of opportunities for both advertisers and consumers alike. Advertisers are presented with a lot of channels to reach out to their target audience almost anytime of the day. On the other hand, consumers can take advantage of a vast amount of information about the products and services they need. The way consumer behavior is shifting towards smartphones, social media, and new modes of communication, it is expected that the demand for digital advertisers will only increase in the coming years. With the rapid changes in digital advertising, it can be a challenge for advertisers to keep up. However, with the constant flow of new data available, it’s easier to stay ahead of the curve. Statistics can give advertisers a solid idea of what to prioritize and where to put their investment.